There was plenty more drama in the Bundesliga on Matchday 21, with big-name stars coming to the fore and a number of new records set. History was made on Friday night as the Bundesliga witnessed its 50,000th goal. Karim Bellarabi, who also scored the fastest goal in Bundesliga history back in August 2014, was the man who wrote his name into the history books as the scorer of the historic strike but in its 54 years, the league has produced a veritable host of stunning efforts to enthral fans the world over. Take a look at ten of the very, very best right here. Javier 'Chicharito' Hernandez may have struggled for goals in the first half of the season, but the Mexican has rediscovered his scoring touch since the turn of the year and is now the league's top goalscorer in 2017. His brace in Leverkusen's 3-1 win over Augsburg means the 28-year-old has netted five times in his last three appearances - as many goals as he managed before the winter break. In addition to Bellarabi's goal, other significant landmarks were reached across the Bundesliga this weekend. FC Bayern München striker Robert Lewandowski scored the latest goal ever recorded in the Bundesliga since data collection began when he earned Carlo Ancelotti's men a point away to Hertha Berlin with the very last kick of the game in the 96th minute (on 95 minutes and 57 seconds to be precise). 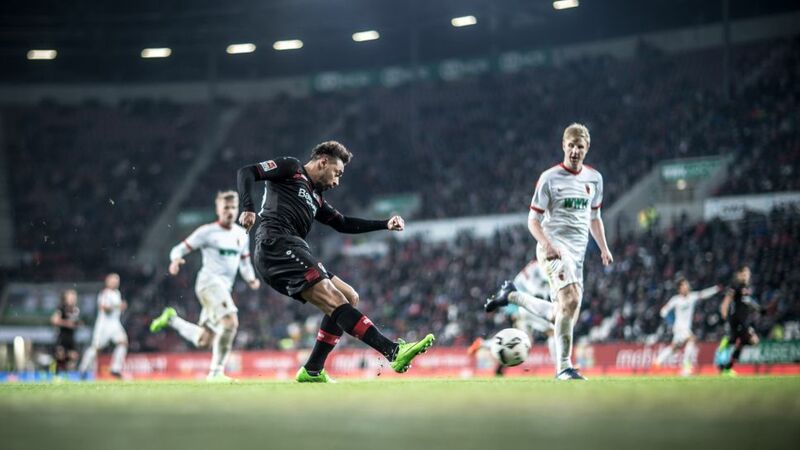 Leverkusen also chalked up their 900th Bundesliga away goal in the victory over Augsburg, while Thomas Delaney's maiden goal for SV Werder Bremen against 1. FSV Mainz 05 means 13 different players have found the net for the Green-Whites this season – more than any other team. Borussia Dortmund star Marco Reus has deservedly long enjoyed a reputation as one of the Bundesliga's foremost creative players, having scored and created dozens of goals for BVB and former club Borussia Mönchengladbach over the years. However, the Germany international is fast being usurped by RB Leipzig's principal mischief-maker Emil Forsberg. The 25-year-old is having a barnstorming debut campaign in the Bundesliga, and notched his sixth goal and ninth assist of the season on Sunday to help Leipzig beat Gladbach 2-1. The Sweden international has now been involved in a goal every 84.2 minutes this term; Reus every 127 minutes. Click here to 'like' the Bundesliga's official page on Facebook! Click here for a round-up of all the Matchday 21 action.